Following its 1 million downloads milestone, Brooklyn-based Etsy has just released version 2.0 its iOS app, which packs a number of additional features, including a new Activity Feed, Explore experience and a stats dashboard for sellers. More specifically, v2.0 lets you: see prices in your own currency, view in-app browsing history, follow Etsians to see their favorites in your Activity Feed, search through treasuries, look up Etsy members, find shops nearby, access a new Shop Stats dashboard to see shop views, orders, favorited items, and revenue (sellers only), browse and customize channels in a new Explore experience and finally check out your Activity Feed. 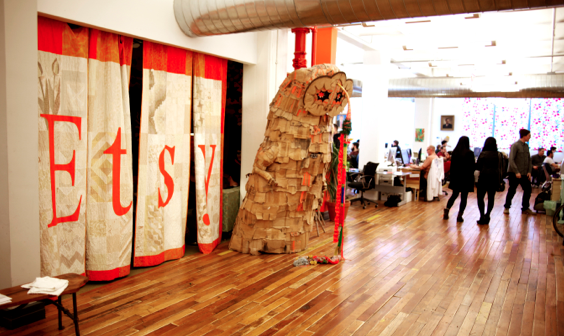 The Etsy app for your iPhone or iPod gives you one-touch access to the world of Etsy. As a buyer, you can browse your activity feed and explore treasuries, search by category, convo sellers, and purchase items directly from your phone. As a seller, you can view your shop stats, access your listings and latest orders, get mobile alerts when orders are placed at your shop. and use merchant tools to manage your business on the move. With seamless mobile integration of your cart, favorites, purchase history, and shop, the app is a streamlined extension of your online Etsy experience. Overall, these changes serve to bolster Etsy’s original offering, adding new features that should help make the app more interesting and interactive without crowding up the user interface.